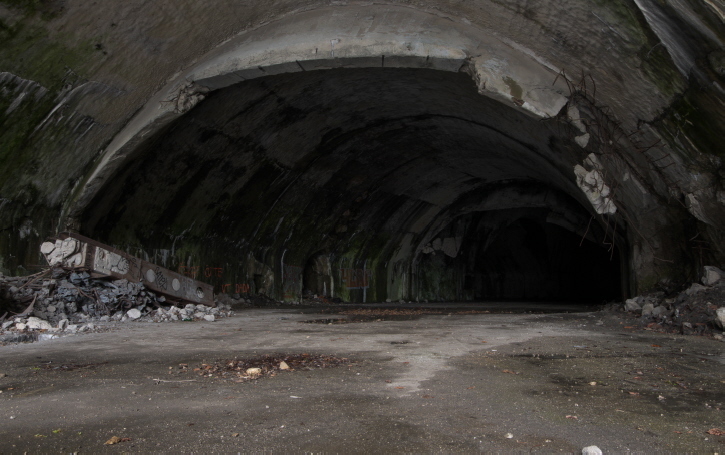 A former Yugoslav Air Force underground airbase on the border of Croatia with Bosnia & Herzegovina. Partly destroyed in 1991/1992 and abandoned ever since, it's now an eerily desolate place, and the tunnel network inside the mountain is a dark (literally!) maze to explore as an urbex adventure. Since parts of the complex are positively dangerous to enter, however, it's best to go with an experienced guide. More background info: It's probably in the (formerly top-secret) nature of such a site that solid background information is not so easy to come by. What info you can find online (including on Wikipedia) is a little suspect in that there's an air of Chinese whispers in the comparison of most such sources. They seem to agree on quite a lot of detail, but given the often exact same wording you have to wonder who copied from whom, and to what degree these details are really reliable. To start with, though, here are a couple of definite facts. The location of the base is a few miles west of the town of Bihać (that's why the base is sometimes also referred to as Bihać Air Base), in what is now Bosnia & Herzegovina, while most of the base is on the territory of Croatia. 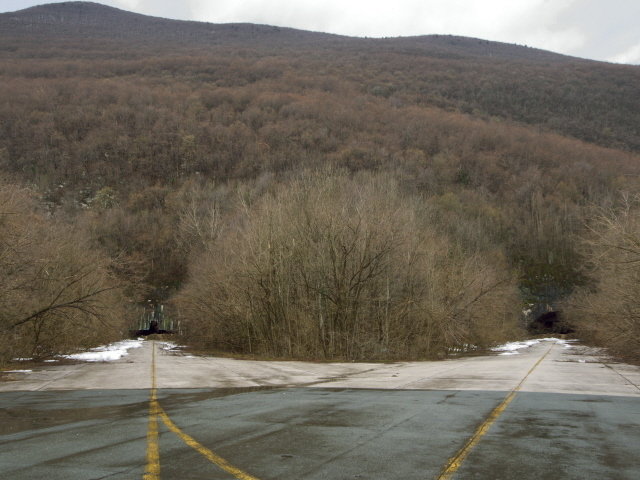 The underground tunnels are inside a mountain called Plješevica, but the base derives its more common name from the nearby village of Željava just to the north-west. When the construction of the base began is less certain. Most sources say 1948, but a few others put it in the second half of the 1950s instead. The project cost an enormous amount of money, as can be expected, but whether the oft-quoted sum of the equivalent of 6 billion US dollars (!!) is correct, remains rather questionable. The base, sometimes also referred to as KLEK or “Object 505”, used to be primarily the home for two (some sources say three) squadrons of MiG-21 jets, but a few other plane types probably used it too. Some sources say that up to 80 jets could be held inside the tunnels, charts in other sources list 52. The total length of the tunnel system is usually given as 3.5 km. 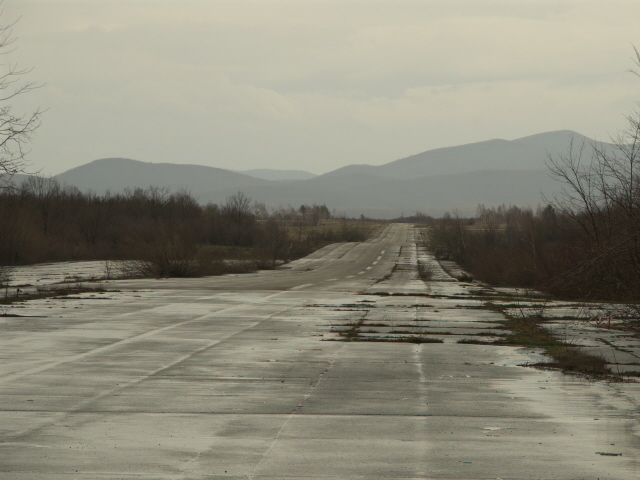 This is said to have made it the largest airbase of its type in Yugoslavia and one of the largest in Europe. The four tunnel entrances had 100-ton retractable concrete blast doors. The blast door openings as well as three of the outer entrances were shaped in such a way that a MiG would fit neatly through (see photos). 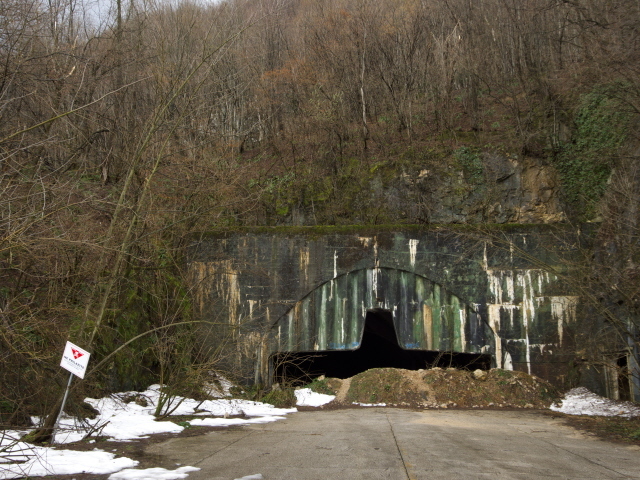 Three of the tunnel entrances are pretty close to each other, whereas one is considerably further south-east (and close to/on the Bosnian border). Many sources say the airbase had five or six runways, but going by the maps and satellite images available, it looked to me more like no more than five in total and out of those only two proper runways (those with the appropriate end markings, 32 L and 32 R), while the other three noticeably narrower ones that connect the two wider ones, appear to have been just for taxiing. A bit of further research suggested, though, that only the two larger proper runways were for both take-off and landing (also suitable for larger planes) while the narrower ones leading straight out of the tunnel entrances could indeed be used for rapid-reaction take-offs by the fighter jets too, but not for landing. In addition to the airbase and its ancillary structures (radars, maintenance workshops, fuel storage, bunker rooms for missiles and bombs, etc., etc. ), there was also allegedly a hidden underground communications, command and operations centre here too, sometimes referred to as STAR, and some sources even compare this to NORAD. That has to be an exaggeration too, though. NORAD, the North American Aerospace Defense Command (hence the acronym) with its main operations centre in a tunnel system inside Cheyenne Mountain in Colorado, was a massive structure designed during the Cold War to control the USA's nuclear arsenal, receive early-warning messages regarding incoming Soviet missiles/bombers and co-ordinate a retaliatory strike, i.e. administering nuclear Armageddon. I find it more that doubtful that non-aligned and non-nuclear-armed Yugoslavia would have had (or needed) anything remotely similar in scale. What is also not entirely clear is whether the base was used in the early phases of the Yugoslav Wars, for instance in the air raids on Zagreb in 1991. 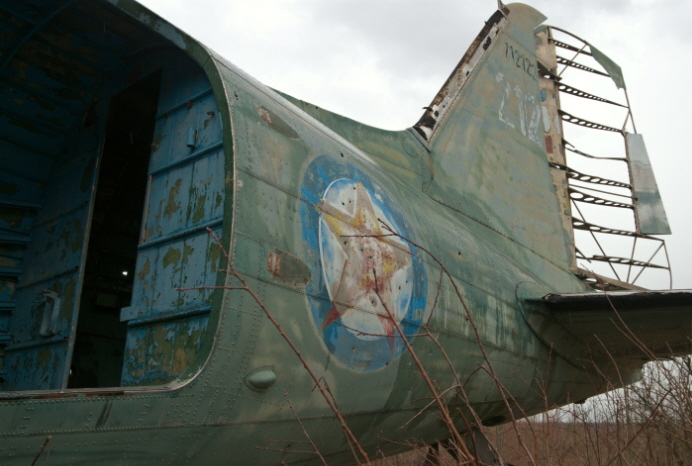 Part of a wreck of a shot-down MiG-21 from Željava, however, is on display at the Karlovac Homeland War Museum. What is clear is that when the Yugoslav Air Force moved out of the base later in 1991, it made sure to destroy the runways by setting off explosives in cavities under the tarmac that had been specifically designed for such an eventuality. The base then fell into the hands of the self-declared Serbian Republic of Krajina. In order to prevent any future military use of the underground airbase, their military then proceeded to detonate dozens of tons of explosives within the tunnel system in 1992. You can still see plenty of evidence of these blasts. The war also left the whole area (and region) heavily land-mined. At the end of the Croatian War of Independence and its equivalent in its southern neighbour, the former base ended up on the border between Croatia and Bosnia & Herzegovina. Most of it is on Croatian land, but it's a border region, so it is guarded by border security forces/police. Under an agreement that's part of the peace settlement, no military installations are allowed so close to a border, so it was clear that Željava wouldn't have any chance of a renewed military future. However, there have been proposals to reuse the runways for private aircraft, but so far it's evident that nothing has come of that. So the whole complex has simply been lying abandoned ever since. From being little more than a little secret known only to few, Željava has over the years earned itself an almost mystical reputation amongst fans of “urban exploration” (the term seems a little inappropriate here, since the place is so far from any actual urban centre). Amongst the many websites that feature Željava, this one (external link, opens in a new window) stands out in that it also features plenty of videos, including many from the past when the base was still in operation. Worth watching, even if you don't understand the language in the soundtrack. Some parts of this by now rather aged website no longer function, and several links are broken, but it's still worth a browse. 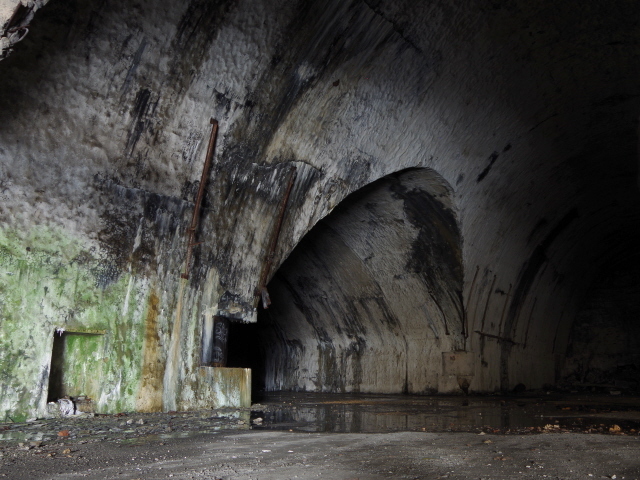 Apparently, the atmospheric tunnels of Željava were once also used as a film location, namely for a car commercial! That was probably the only time the tunnels were lit up by plenty of high-power lights since they'd been abandoned, providing a brief reprieve from the eternal darkness inside this exceptional ex-military troglodyte warren. What there is to see: When we got there we first went to the border-crossing just north of the Željava area. This was so that our guide could inform the border security of our intended presence at the old airfield. The guide said the border police don't mind as long as they know about it. Apparently our guide was already so familiar to the staff at the border that they said “oh, it's you again ...”. Well, I guess that kind of vouches for the guide's experience. 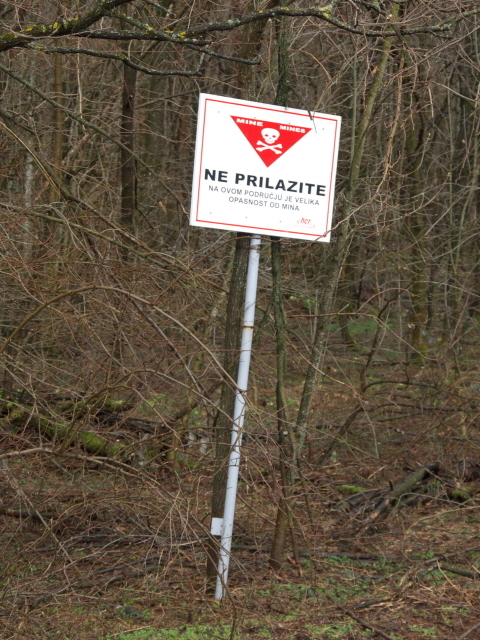 We then drove through Željava village, past a plane wreck (that we came back for later – see below), and straight to tunnel entrance No. 1, where we parked and got out. It was at the end of March (in 2018) but there was still plenty of snow that we had to wade through before climbing over the earth mounds in front of the tunnel entrance (probably dumped here to prevent anybody driving a vehicle into the tunnel). It was also a very rainy day, so water was dripping from cracks in the ceiling in the initial section of the tunnel, making for an eerie, muffled waterfall kind of sound. A short distance after the main entrance, the actual first gallery for the planes branched off at a right angle to the left, while the first tunnel continued on to a dead end. Of course this was extra protection from nuclear blasts. The gallery branching off to the side had its own protective blast door. There was very visible evidence of the explosions with which the complex was destroyed in 1992 (see above). 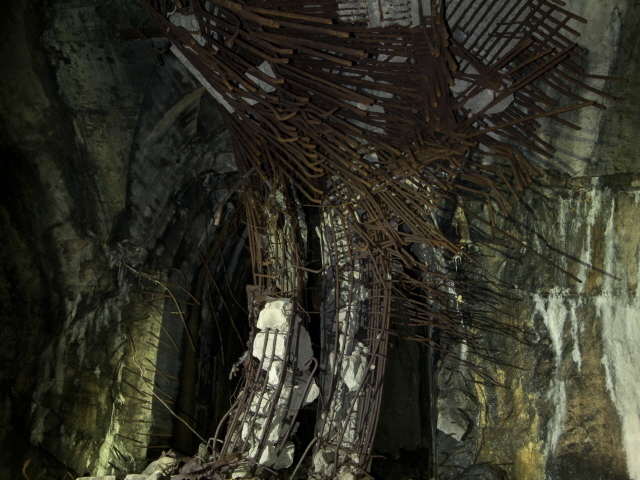 Concrete and steel hulks mangled by the blasts, sometimes in extraordinary shapes. On the floors there was debris strewn about everywhere. Otherwise the floor was fairly smooth and straight inside the main gallery, i.e. where the MiG-21s would have been parked safely underground. So at least no sudden holes in the ground here. That was different in the rooms and tunnels branching off from the main gallery, where we had to watch our step even more carefully. There's lots of mangled rusty metal here too, parts of heavy machinery, remnants of the fuel storage tanks, ruined toilets/bathrooms, and such like. 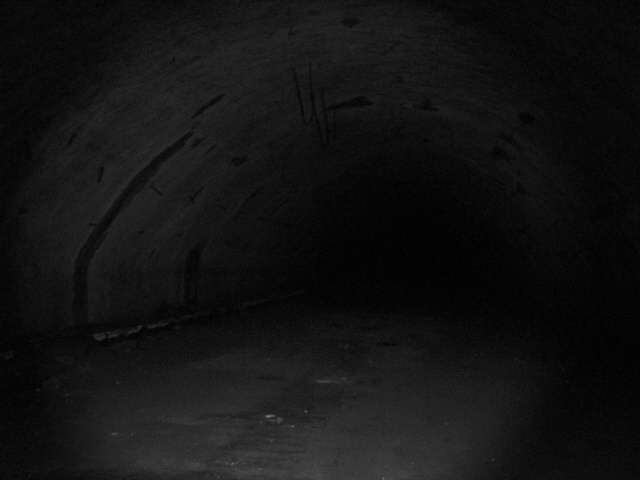 Needless to say, once you turn the corner and leave the still daylight illuminated initial section of the tunnel behind, it soon gets totally pitch-black dark. Without torches you'd see absolutely nothing. But even rather powerful torches can barely illuminate such enormous cavernous spaces. So even in torchlight it remains rather dark – you can never see much further than a few dozen yards, if that. So it's not for people afraid of the dark or those who suffer from claustrophobia! The dark conditions also made photography extremely tricky, especially with regard to autofocus, so I often had to rely on going manual (but even that was difficult to set in the general gloom). A tripod is also essential for all those long exposures. We proceeded along the curved shape of gallery 1 until we got to a connecting tunnel, which ended in a dead end on the one side while in the other direction it led to the blast door for entrance 2. But we carried on into the second aircraft gallery in the centre of the complex. Shortly after the intersection of galleries 1 & 2, we took another side tunnel and at its end stood at the bottom of a former elevator shaft. This would once have been the connection up to the control tower on the mountain. But today it's just a gaping dark hole overhead. It was quite spooky pointing the torch up and watching the drops of water appear in the cone of light – like little shooting stars in a night sky. As you would expect at a place like this there was also some graffiti to be seen, though not an awful lot. One said “Tito” next to an arrow, which I found mildly amusing … I doubt you'd find the good old Broz in here these days (see Tito mausoleum!) though there are photos of the Yugoslav leader visiting Željava in person. At one point there was what looked like a memorial shrine of some description, with the typical little red cemetery candles. Our guide suggested that this was to honour a legendary Croatian urbexer. Could well be. 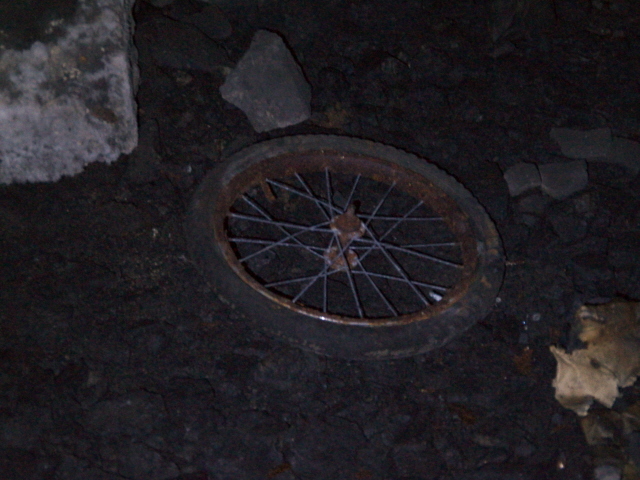 In addition to all the debris of concrete and mangled metal, whose former functions mostly remain obscure to the untrained eye, there were also some unexpected mundane objects suddenly appearing in the dark, like an office chair or an isolated wheel. We walked the length of the rest of the similarly curved gallery 2 to the point where a third gallery branched off to the right. This would have led past the STAR complex (see above) and eventually to entrance No. 4. But instead we headed for entrance No. 3 and left the dark of the underground tunnels that way. I also went back to inspect entrance No. 2 closer up from the outside, as this was the one that still had its camouflage painting on it. Back in the day it would have been further protected by camouflage netting. But that had long gone. A small side entrance just led to an empty chamber that probably used to be a guard post. Just outside entrance No. 3, I also spotted what looked like a bomb, except its main body was made of concrete – so I presume it must have been something like a dummy bomb used for fighter pilot training. We looked down the central runway – which to me seemed rather wobbly – but did not explore the airfield any further (i.e. 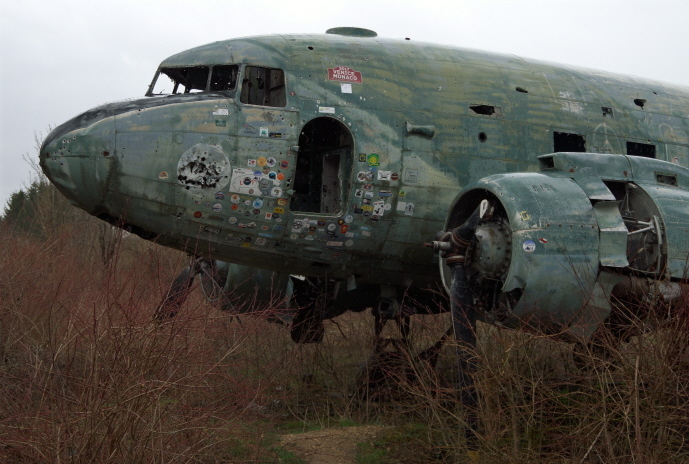 to inspect the bomb damage to the runways), but, as we were a bit pressed for time for the second half of our tour (to Villa Izvor), proceeded back towards Željava village and the plane wreck parked there. This plane is an old Douglas C-47 “Dakota”, the military transport version of the civilian passenger plane DC-3. This specimen had Yugoslav Air Force markings still quite visible, so I guess it must date back from the time when Tito had fallen out with Stalin and the USSR and for a while instead had his military equipped with planes from the USA (before resorting to the Soviet-built MiGs). In the past there used to be a couple of wrecks of US-built F-84 “Thunderjets” next to the Dakota, but these have now gone. You can in theory clamber inside the plane and even sit in the cockpit, but given the time pressure and the fact that the weather had turned very bad again at that point, we got back in the car and drove off. All in all, the tour of Željava was definitely a highlight of my trip to Croatia in March/April 2018, certainly on the level of urbexing adventure. Most of the background information presented here I had to glean from online sources, though, on site there is zero commodification. But that's OK, the dark atmosphere was what I had come for in the first place anyway. The only regret I had about the tour is that I wish we could have had more time in the tunnels to explore further, and, perhaps more importantly, at a somewhat slower pace that would have been more conducive to getting the tricky photography right. I often didn't really get the time to set up my tripod right and get the camera settings properly adjusted, and instead sometimes had to rely on a rather quick hit-and-miss strategy as we moved on. Location: in the centre of western Croatia, right on the border with Bosnia & Herzegovina. The nearest larger town is Bosnian Bihać, just a few miles across the border. The nearest larger places within Croatia are much further away, Karlovac ca. 60 miles (100 km) and the capital Zagreb ca. 90 miles (145 km). Access and costs: only by car, or on a guided tour; no admission fee, but guided tours obviously cost. Details: In theory you can get to Željava independently, provided you have a (hire) car. Coming from the north on the No. 1 trunk road that leads to Plitvice carry on southwards until you come to the turn-off of the No. 504 road on the left. Drive this all the way to Ličko Petrovo Selo, where you have to turn right onto an unnumbered road towards Novo Selo Koreničko and Željava. Drive through the village of Željava and carry on along the small road leading south-east from where the old Douglas Dakota wreck is. This road takes you all the way to the tunnel entrances. NOTE, however, that this is borderland, so you might encounter police/border security. You might be alright and get away with it, but should you inadvertently step into Bosnian territory you might get into trouble and/or have to pay a fine. Best practice is to let the border staff know in advance that you intend to go to the former airbase. This can be done at the nearby border crossing point at Izačić. The language barrier may make this a little tricky, though. Not least because of that, and also to take the element of navigation out of the equation, I decided to go to Željava on a guided tour with an urbex-experienced guide and a driver. For this I used the specialist company “Destination Urban” based in Zagreb, who offer this trip as part of their regular portfolio, though I had the tour adapted a bit, namely to start from Piltvice and with Villa Izvor tagged on to the tour to make it a full day programme. The price I was charged for this (for two people) was just under 1500 Kuna (or ca. 200 EUR). Joining a stand-alone Željava group tour from Zagreb with more participants pushes the price down, of course. 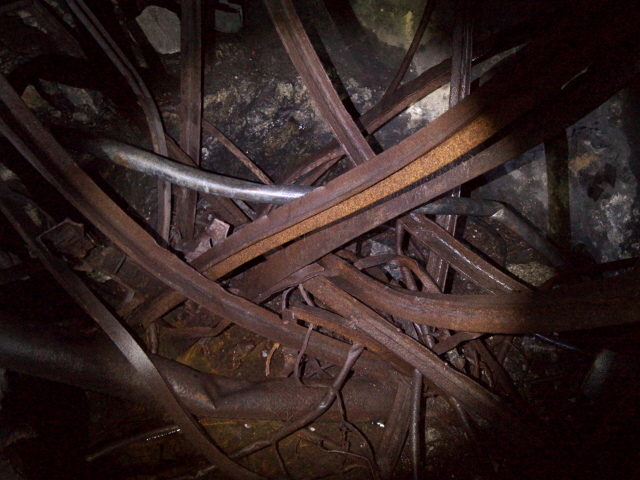 DANGER: parts of the tunnel complex inside the mountain are unsafe and in danger of collapse. This applies in particular to the former STAR early-warning and command centre. I've seen photos of this online that clearly show the severe damage to support columns and other structural elements due to the explosives set off here in 1992. The tunnel to entrance No. 4 (southernmost, towards the Bosnian border) is also said to be in danger of collapse, as evidenced by big cracks in the ceiling. At entrance No. 1 and the blast door further in you shouldn't stand underneath the big blocks of concrete hanging by a metal thread from the ceiling as these could come down at any moment. BE PREPARED: don't enter such a site in flip-flops, shorts and T-shirts, but in appropriate attire, and, most importantly, wear proper boots. Protective gloves aren't a bad idea either. And always watch your step. There's debris everywhere, and in some deeper parts there may be sudden holes in the floor. So take great care. The most important type of item to bring with you is good, strong torches/flashlights, as it gets pitch-black dark once you get away from the daylight of the entrances. Make sure to bring more than just one (ideally also a strap-on head-lamp so you can have your hands free), and maybe have spare batteries at the ready. You do not want to be caught out without light in this dark labyrinth. Also make sure not to venture too deep into side tracts and risk getting lost. These safety concerns are yet another good reason for going with an experienced guide … see above! The guide I had took a whole bag of torches along too, so the one I took was only backup. 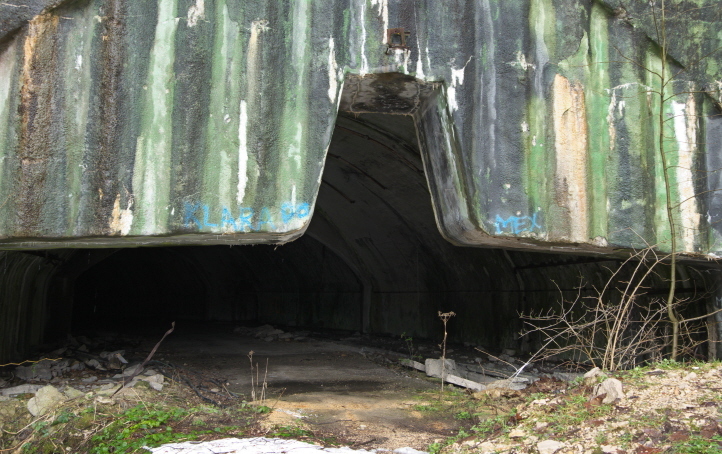 OTHER Health & Safety issues: the possibility of the presence of radioactive materials inside the tunnels is mentioned in some articles about this place, but other sources rather dismiss this. More concretely, though, pollution with PCBs is a concern, especially in the deeper and dustier parts of the tunnels. That's why some advise wearing a nose-and-mouth-protecting mask when venturing into the tunnels. Time required: very much depends, between just half an hour or so for just a quick look into the tunnel entrances, but without exploring the dark deep inside, and several hours of thorough exploration. On my guided tour we spent something like two hours at Željava in total, ca. three quarters of that inside the tunnels. Combinations with other dark destinations: nothing in the immediate vicinity – though we copmbined it with a visit of the abandoned Villa Izvor near Plitcice. Combinations with non-dark destinations: The biggest scenic tourist attraction of Croatia, The Plitvice Lakes National Park is fairly close by, only less than 15 miles (22 km) or ca. 30 minutes driving time. The Adriatic coast is a little further away, some 70 miles (110 km) to the west, or ca. two hours driving time.